I’m not talking about romantic love, though he seems to do almost bafflingly well in that department, too. Here, I’m interested in something else: Funny female writers and filmmakers have tended, more often than random chance would dictate, to be strongly, obviously influenced by Allen, moreso than any other male auteur I can think of. Why would this be? It’s strange to realize how much influence Allen has had on women-centric entertainment, given his own problematic relationship to women being played out over and over in a lot of his work. When he’s not reveling in the glories of much, much younger women, he’s fetishizing the whole lot of us, worshipping us to the point of unknowability. He basically invented the now well-known archetype of the manic pixie dream girl. What is it about his work that still speaks to so many smart women? I have some theories, though no definitive answers. He relies heavily on intellectual dialogue and emotional relationships, which ends up looking like a romantic comedy whether it means to or not. 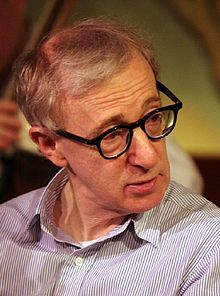 (Interesting that he just gets to be Woody Allen, though, essentially his own untouchable genre, while Nora Ephron has long been considered that lady who writes the chick flicks.) That’s traditionally been a female-driven genre, and the talky-feeling-y kind of stuff Hollywood has tended to let women write more often, though Judd Apatow and his ilk have changed that of late. Perhaps that’s why I’m looking forward, despite Allen’s missteps and personal issues over the years, to his newest, Blue Jasmine. I don’t even know what it’s about, but I know it’s got Louis C.K. — a definite bonus — and is likely to be smart and funny and poignant. In a world too low on great romantic comedies or movies about women, this is the closest I can get.